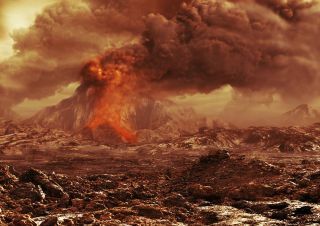 Artist’s impression of an active volcano on Venus. New evidence hints that Venus may be volcanically active, which has long been a controversial topic among scientists. Six years of observations by the European Space Agency's Venus Express spacecraft have shown significant changes in the sulfur dioxide content of the planet's atmosphere over time, which could be explained by a bout of volcanism. Immediately after arriving at Venus in 2006, the spacecraft recorded a significant increase in the average density of sulfur dioxide in the upper atmosphere, followed by a sharp decrease, according to a release from the European Space Agency (ESA). Sulfur dioxide doesn't last long in Venus' upper atmosphere, because it is broken down by sunlight. Any sulfur dioxide in the upper regions must have recently arrived there from the thick protective clouds that swirl beneath. Some scientists think the spike in sulfur dioxide suggests that a large volcano — or several volcanoes — must have erupted. Venus is covered in hundreds of volcanoes, but whether they remain active today is much debated, and settling this question is an important scientific goal for Venus Express. The mission has already found clues pointing to volcanism in the planet's recent geological past, within the last few hundreds of thousands to millions of years. Previous measurements of infrared radiation from the surface pointed to lava flows atop a volcano, suggesting that the volcano had erupted recently. The rise and fall of sulphur dioxide in the upper atmosphere of Venus over the last 40 years, expressed in units of parts per billion by volume (ppbv). NASA's Pioneer Venus mission, which orbited the planet from 1978 to 1992, saw a similar peak and decline in sulfur dioxide. At that time, the preferred explanation was an earlier injection of sulfur dioxide from one or more volcanoes. "If you see a sulfur dioxide increase in the upper atmosphere, you know that something has brought it up recently, because individual molecules are destroyed there by sunlight after just a couple of days," said Emmanuel Marcq of LATMOS, a French research institute, in the statement. Marcq is the lead author of a paper describing the findings, published in the journal Nature Geoscience. "A volcanic eruption could act like a piston to blast sulfur dioxide up to these levels, but peculiarities in the circulation of the planet that we don't yet fully understand could also mix the gas to reproduce the same result," noted co-author Jean-Loup Bertaux in the release. Venus has a bizarre atmosphere that whips around the planet in just four Earth-days, much faster than the 243 days the planet takes to complete one rotation about its axis. Such rapid atmospheric circulation spreads the sulfur dioxide around, making it difficult to isolate any individual points of origin for the gas.